(CNN) -- Delta Air Lines has been denied permission to fly directly to Nairobi, Kenya, and Monrovia, Liberia, until security standards there are met or until assessments change, the Transportation Security Administration said Wednesday. 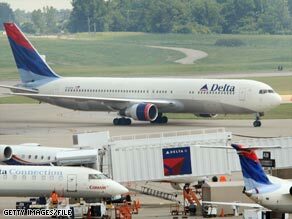 Delta was expecting to begin direct flights to three African cities this month. The agency said it is allowing the airline to go ahead with plans to fly directly to Abuja, Nigeria. Delta had announced the direct flights to the three African cities last year, and air service had been expected to begin this month. The Transportation Security Agency said in a written statement that it has denied Delta's request to fly to Nairobi from Atlanta, Georgia, and to Monrovia from New York because of "security vulnerabilities" in and around the Kenyan capital and security deficiencies at Roberts International Airport in Monrovia. "TSA, along with key partners within the U.S. government, assess a credible threat to civil aviation in East Africa," agency spokeswoman Kristin Lee said. "At this time, the current threat is too significant to permit these flights." Delta said in a written statement that it has been "contacting customers to reaccommodate them on long-established connecting flights offered by our joint venture partners Air France-KLM and other SkyTeam member airlines, which carry Americans to these destinations in Africa through their European hubs." The Department of Homeland Security had informed Delta of the decision Tuesday, the airline said. "Africa continues to be an important region for Delta," the airline said, noting that it offers scheduled service to Accra, Ghana; Cairo, Egypt; Johannesburg and Cape Town, South Africa; Lagos, Nigeria; and Dakar, Senegal. The Transportation Security Agency said it has had "an active dialogue" with Delta throughout the process of assessing the airline's requests. The agency said it will continue to monitor the situation. A security team is currently in Monrovia, Lee said. All About Delta Air Lines Inc.